Card Text Play: Your opponent discards each of their archived cards. You gain 1 for each card discarded this way. If I have some of my opponent’s cards in my archives when I play Dysania, do they leave my archive? No. Dysania only affects cards in your opponent’s archive (regardless of who owns the cards) and not your opponent’s cards in either archive. 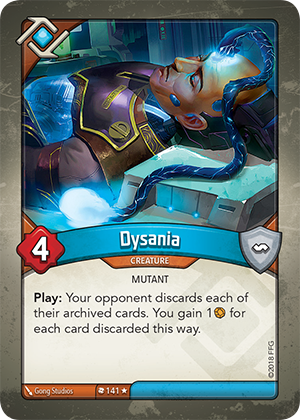 When I play Dysania, what happens to my cards that my opponent put into his archives using cards like Sample Collection, Mass Abduction or Uxlyx the Zookeeper? And do I get Æmber for those cards? As stated on those abilities, your cards that were archived this way would return to your hand. Since they were returned to hand and not discarded, you do not get Æmber for those cards.